Comes with a 25 round gas magazine. Click the button below to add the Army R.28 Kimb. 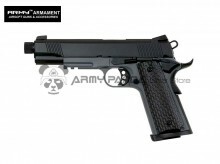 Style GBB Pistol (Black/Grey) to your wish list.